Description of "Mosquitoes Flies and The Lion "
in a jungle all animals live in harmony with the Lion as their king. As in society animosity develops which leads to crime. A struggle to displace the Lion begins. The new power holders are the mosquitoes and the flies as numbers matter in a democracy. But can they successfully compete with the Lion in meeting with the requirements of a jungle in a progressive manner? A simple fable to create social awareness and political responsibility in children and young teenagers. Poonam Baijal is a lawyer by profession. Being a mother of two children the successful upbringing of children always remained an important issue. Just good marks do not make a child into an adult of responsibility and honesty. There are other issues she must be connected to at an early stage, to eventually become a good citizen which is the major requirement of our country. This is the first of a series of simple fables aimed at doing just that. 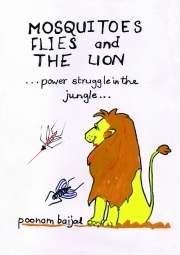 Reviews of "Mosquitoes Flies and The Lion "